The neighbor from hell wants to enjoy an undeserved holiday – reason enough for Woody and the camera team to sneak along onto the cruise liner to make the nasty neighbour's holiday a living hell. This time, the neighbor's mum has joined him, and she is taking good care of her baby. Get the neighbor from hell into his mum's and fellow travelers' bad books, play tricks on him and give free reign to your vengeance. 14 new tricky and highly detailed episodes of the popular "NEIGHBORS FROM HELL SHOW"
A sequel to make all games developers think with the advent of Neighbors from Hell on Vacation which fortunately starts on board the cruise ship with a tutorial for the uninitiated. 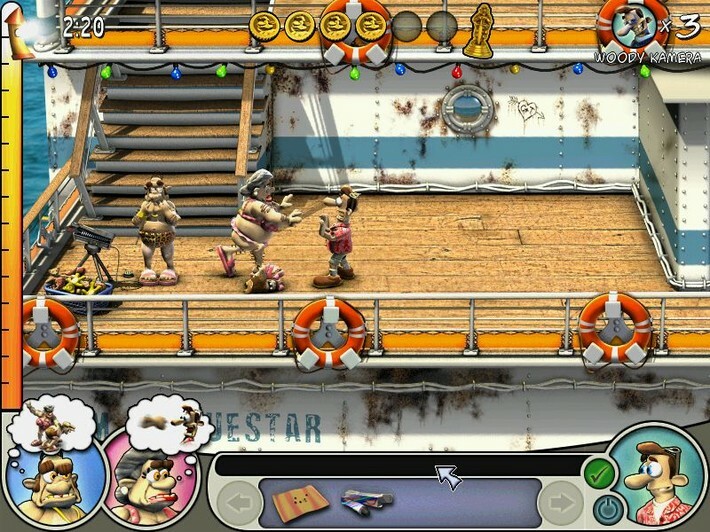 The director of the game kindly teaches players the delicate art of pulling pranks and unlike the original game, Woody and the neighbour are not confined to a single location. The journey on the cruise ship takes Woody and the neighbour to China, India, and Mexico with the diversity of locations that makes for opportunities to perform a number of unique tricks and keeps the game from becoming repetitive. 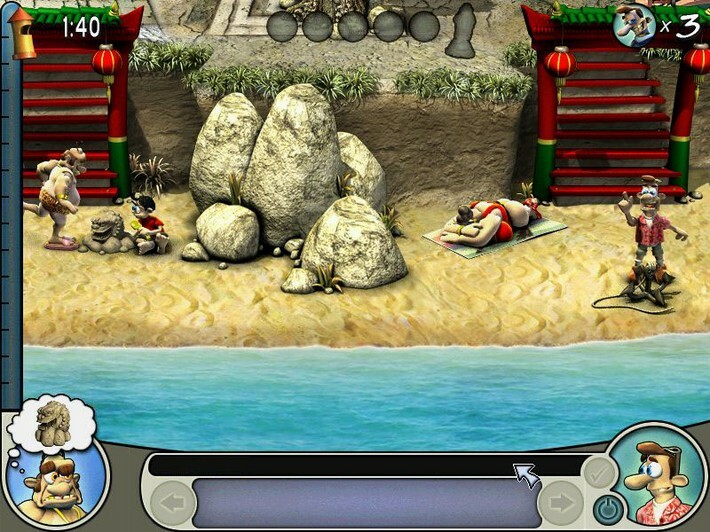 Players are expected to keep their eyes open and look for all the tools they can use to pull the most twisted pranks. The core game play is very similar to the original game where in each episode, the neighbour has a specific routine. He walks around from one area to the next, performing various actions and engaging in numerous vacation activities. From waterskiing to wooing one of the passengers on the cruise ship, the neighbour tries to relax and have a good time in a number of ways. Of course, it is Woody’s job to make sure the neighbour has a miserable time instead. Players are expected to observe the neighbour’s routine and look for ways to disrupt it. There are numerous tools Woody can utilize to prepare tricks in each episode. Woody has to find the right tools and use them on the correct objects to prepare his pranks while hiding from the neighbour to avoid detection. Continuing his regular activities, the neighbour never suspects a thing and eventually comes full circle on his routine and falls right into the trap. In order to complete each episode, Woody has to find and perform a predetermined number of tricks. Upon completing the required amount, players are allowed to leave the episode and move onto the next one. However, the real challenge comes from finding all the tricks and performing them in the correct sequence to make the neighbour completely infuriated. Each time he falls for a trick, the neighbour’s anger meter rises and if Woody manages to set off another trick before the neighbour can calm down, he gets angrier. In each episode, setting up the tricks in the most effective way, Woody can completely fill up the neighbour’s anger bar, causing the miserable man to throw a fit. Achieving the maximum fury level gives you extra points and helps Woody win an award for the episode. It also delivers the sadistic and decidedly twisted satisfaction of harassing an obnoxious man to the fullest extent possible. In conclusion, Neighbours from Hell on Vacation most certainly succeeds in creating a humorous and whimsical atmosphere, however fails to deliver a true laugh as the game is extremely clichéd and probably suited to the younger gamer. Featuring cartoon-style graphics and some mediocre sound effects, this game is strictly for those that want something left of center. It's Bugs Bunny, Wild Coyote and just about all comic gags are featured in this strange title.